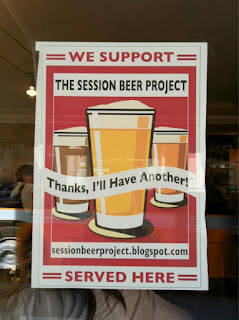 The Session Beer Project™: Session Beer Day: thanks to you, an unbelievable success! Session Beer Day: thanks to you, an unbelievable success! Session Beer Day was a huge success! We saw support from bars, brewers, beerlovers, Untappd, and from beer drinkers around the world. Some people really got into it (Thanks, Nora!) When the Untappd Session Beer Day badge reports started rolling in from Indonesia and New Zealand late Friday afternoon, I started to realize what we had going on. Reports rolled in all day long about where people were drinking session beer, what session beers they were drinking, and how they loved the idea. Were there disagreements? Yes, of course. Mainly there was sniping from the 4.0%-or-under diehard crowd, and a couple late comments from those who wanted to drink big beers (and were we trying to stop them from enjoying the beers they wanted? Of course not!) that went over the bounds of polite discourse. But as @DCchillin noted, "Has anyone else noticed that in heavy 4.5% vs. 4% #sessionday debate, there's not been much 4.5% vs 5% or higher?" It was mostly about whether 4.5% was too high, not too low. I consider that a win, because if it's under 4.0%...it's definitely under 4.5%. I have no problem with that. And if anyone wants to argue that 4.5% is too high to be session beer, well, at least they're keeping the conversation reasonable. 5% is a matter of not enough distinction; 6% is just silly. And that's about all I have to say on the "disagreement" and "controversy" over session beer definitions. Because folks showed up for Session Beer Day in a big way, especially after only 19 days of preparation! There are brewers who are thinking up session beers now, there are bars that are reconsidering their tap set, there are drinkers who have found out that small can be beautiful...all because of Session Beer Day. We will definitely do it again next year, and it will be on April 7 again (a Sunday), and it will be BIGGER. There will be more session beers available, there will be more participating bars and breweries, there will be more people supporting it. The tricky question is this: how do we keep up the level of interest we generated?! Ideas are welcome, but you know the best way to do it...keep asking for session beers from your local brewers and bars. Keep Tweeting when you find a good one. If you're a bar, please consider having at least one session beer on at all times, and if you do, get the sticker and display it! 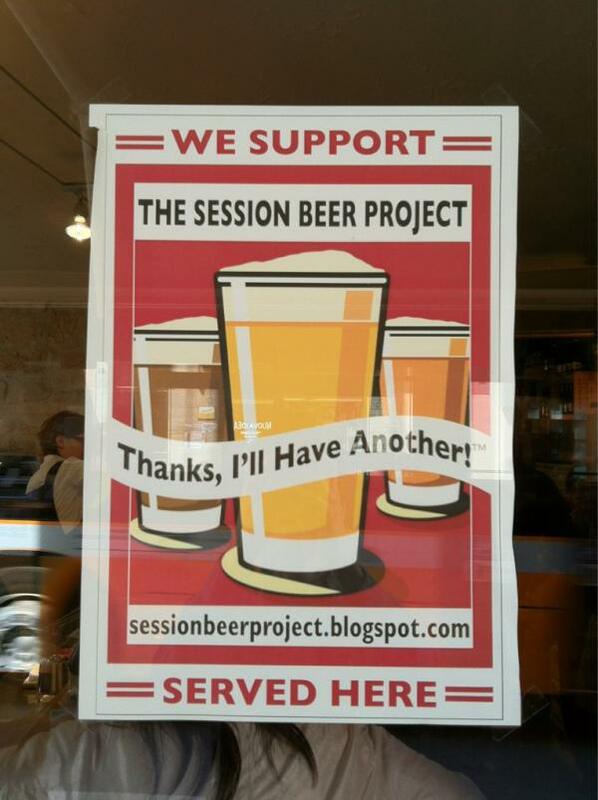 And one other thing: don't bother getting into arguments over what "defines" a session beer. If someone wants to say a 7% IPA is a session beer, laugh and keep moving. If someone insists session beer can't be over 4.0%, drink 3.7% mild with them and enjoy yourselves. This isn't about arguing, and it isn't about numbers. It's about enjoying lower-alcohol beer with good, balanced flavor. Next year: Session Beer Day. April 7, 2013. See you there! My Session Beer Day was followed by singing Easter Vigil mass, then Easter morning mass, then cooking and eating a big family meal for Easter, followed by the arrival of more family, who we then went to Manhattan with for three days of sightseeing (and eating and drinking) while I tried to cram in necessary magazine work. I was home for about 10 hours, then took my daughter on three days of college visits and more family visiting, then more singing today and finishing up our taxes! Lew- Congrats are a great day celebrating a beloved beer catergory. I enjoyed meeting you at Yards talking Session Beer and the Craft Distilling Conference. Hope to see you next year.